Once again we’ve picked the brains of the Ullapool people and copied their ideas for a trolley, which is 90% there, just needing some paint, some scrap carpet glued to the supporting pads and the axles drilled to take big washers and pins to stop the wheels falling off. 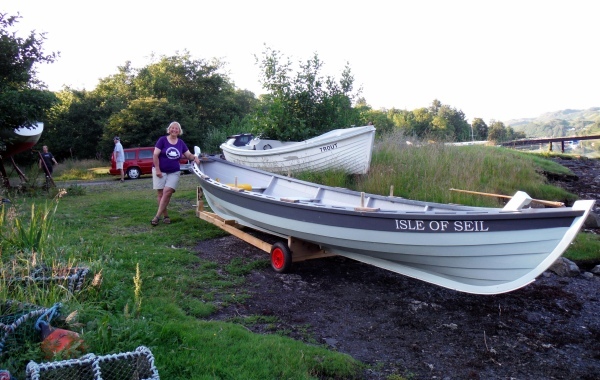 Image completed by Sue, fighting fit from the worlds in her new St Ayles skiff teeshirt. Which reminds us, serious work now needed to organise teeshirts, hoodies,car stickers and our flag. This entry was posted in Building the boat, Getting Involved, Uncategorized. Bookmark the permalink. Done my best, the rest is down to nature. The trolley is now complete, although some carpet has floated away … There are two harness straps to help launch & recover – makes the ‘hernia-height’ handles more tolerable. The straps (black) are kept in the fridge with the lifejackets and are best crossed over. Mary & I launched and recovered on our own, essentially, last week and it works well. Jenn & I can have our stobbs back now! Glad to see your trolley, I had a great time rowing with you in August. Our skiff is getting going, we will be starting our build in the next couple of weeks.